WASHINGTON — Julien Blanc, a self-described “pickup artist” and spokesperson for a group called Real Social Dynamics, is promoting misogynistic and racist attitudes through his seminars on how to attract women, according to a bulletin from the Japanese American Citizens League. 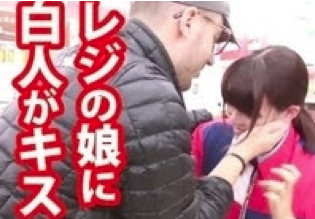 An image from a YouTube video of Julien Blanc forcibly touching a Japanese woman. He has recently targeted Japanese women specifically. Blanc has several “boot camp” seminars around the world planned, many in cities with a JACL presence. Concerned community members have started an online petition on Change.org. The petition urges hotels to stop hosting his seminars and for digital media content providers iTunes and Rackspace to remove his content from their libraries. As of Nov. 21, the petition had 53,085 supporters, with 21,915 more needed. This petition has successfully put pressure on hotels in Seattle and Austin, as well as Melbourne and Brisbane in Australia, to cancel Blanc’s seminars, and helped create enough outrage that Australia revoked his visa and banned him from the country. An article in The Japan Times describes similar efforts and petitions in Japan opposing Blanc and his scheduled visit to Tokyo this month. This campaign against him is full of inaccurate and misleading accusations. Julien and RSD coaches *never* encouraged *any* form of violence or racism against *anyone*. The authors are so mistaken it’s not even funny. I dare you to watch it and honestly say that this campaign isn’t out of context ! Most people out here don’t even know who he really is. Julien Blanc and RSD members are self-improvement coaches who are focused on helping men to become better with women and life in general. They focus on helping them achieve their best self by becoming more confident, social, outgoing and empathetic with people in general. They give genuinely good advices in the area of dating to help men have more fulfilling relationships with women. The reason so many people believe Julien is evil is because of a big misunderstanding about his attitude. He has a dark sense of humor and is likely to say anything if it can make people react. Everyone who knows him is perfectly aware to always take what he says with caution, because most of his provocative tweets are meant to chock his audience and should not be taken literally in any way. The feminist Jenn Li got offended about a video he made in a seminar in Japan. In that video, his words were taken out of context and labeled as racist, misogynistic and encouraging violence towards women. Let me tell you straight off that Julien and RSD *never* encouraged *any* form of violence against *anyone*. I know all the RSD teaching, I’ve watched all of their videos for years, and I know some of them personally. They have genuine good intentions, are really empathetic towards women and teach men how to give women the best experiences. I’ll repeat, they would *never* promote *any* form of violence. Many people interpeted “whatever you want” in the wrong way. He actually meant that if you are in Japan, you don’t need to change your behavior to interact with girls simply because their culture happens to be more socially reserved than, let say, the american culture. His message is that you can be yourself, express yourself freely, be outgoing and confident and girls will still like you for it. You don’t need to « shy yourself off » in order to fit in the local culture, a Japanese girl can love an American man even if their habits and ways of expressing themselves are different. Taken out of context, this may sound like an assault on the girl. But when you see the whole interaction, you realise that she laughs, giggles, enjoys his company and that it’s just part of the fun they have together. Julien is highly aware of a girl’s emotional reactions, he has a high sense of social acuity and will always adapt his behavior according to her reactions. If she reacts badly or seems uncomfortable, he will always adapt his behavior by switching to a more accurate rapport with her, for instance a casual conversation. He does that all the time but always in consideration to where she stands emotionally. Yelling ‘pikachu’ has been interpreted as being racist. Let me tell you that Julien would say any cliché, from any country, anywhere in the world, if he feels like it doesn’t hurt her feelings and adds more fun to the interaction. In the video, he laughs about it and if you feel the general vibe, the energy, you can sense that it’s not a serious prejudice. Every culture has its clichés and he’s perfectly aware of it. He doesn’t want to hurt anyone, it’s just part of the fun. If you feel bad about someone throwing a cliché at you, it’s your problem because you are in charge of your own emotions. Nobody has power over you unless you give it to them. – At a store, he gets close to the cashier and whispers in her ears or try to kiss her on the cheek, while she seems uncomfortable. It’s obvious that any cashier, anywhere in the world, would appear shy and intimidated if a stranger tried to kiss her while she’s at work. Julien is aware of that and the only reason he’s doing it is because he had thousands of good experiences like that where he met girls around the world and got tremendous success. He’s confident in his own ability to make her relax and at ease with it. That allows him to push the limits of what is considered to be socially acceptable by society and to offer an interaction that is unique for the girl and steps out from the other ones. If she doesn’t like it, he will always back off and switch to a more casual conversation. That’s called calibration. He would *never* force *anyone* to do something they don’t want to. Another example of extreme provocation is his « choke » move when he puts his hand on the girl throat while smiling. When he does that, he always has a playful smile on his face, and he explained many times in his videos that as soon as he senses that the girl isn’t comfortable with it, he will stop immediately. He only does that if she seems at ease with his playful challenge. Julien never takes that seriously, it’s always to amplify the emotional range of the interaction, giving her an emotional rollercoaster, while being ready to back off anytime if necessary. Many other examples are his tweets and facebook statuses that are meant to chock and provoke strong emotional reactions from his audience (like the Duluth model, a graphic about domestic violence posted on his Instagram, which was over the line in my opinion, but is still aligned with his sense of humor if you understand it). He should add a disclaimer that it’s not to be taken at face value, but who would reasonably think that this guy is serious about it ?! Thousands of people apparently… I can’t believe you and the media bought into this misunderstanding so easily. If you want more information instead of disinformation, watch some of his videos. – “Retard Player Who Tanks VS Genius Player Who Fucks”, between 3min50 and 7min30, you’ll see that he has more understanding about his influence on people than you assume (http://youtu.be/_oIoEgpfnaA?t=3m49s). There are many other videos, freely available, which have lots of insights about the dating life. All of their teaching have been freely available on Youtube for years. They only charge for private coaching or for special events if you want to go deeper. I really hope that some of you take the time to understand my point and honestly try to look into how far this misunderstanding went. It’s a shame to see so much arguments from genuinely good people and mislead articles simply because of a lack of understanding of each other. Peace to you guys and have a nice day.